BioTech Beta Alanine is a dietary supplement containing top-quality beta-alanine in powder. The preparation helps to delay the occurrence of tiredness during workout, thanks to which it is beneficial for the efficacy of training by making it possible to increase its duration and intensity. Beta-alanine, also known as 3-aminopropanoic acid, is an endogenous amino acid. Beta-alanine is one of the so-called β-amino acids, in which the amine group is bonded to the β carbon next to the carboxylic group. A natural source of beta-alanine is above all red and white meat. Although beta-alanine is an amino acid, its main activity is not based directly on participating in protein synthesis. That is because the amino acid along with L-histidine forms a dipeptide called carnosine, and it is carnosine that is mainly the reason why beta-alanine supplementation is so beneficial. An increase in carnosine levels in the organism leads to numerous physiological “upgrades” in muscle cells, which makes it possible to intensify workout. Carnosine is one of the basic dipeptides and is found mainly in skeletal muscles, especially in type 2 muscle fibres (fast-twitch) and, to a lesser extent, in type 1 muscle fibres (slow-twitch), as well as in the central nervous system, mainly in glial cells and olfactory neurons (responsible for the sense of smell). Carnosine synthesis in muscles requires the presence of amino acids – alanine and histidine. The content of carnosine in tissues depends greatly on the diet. Eating meals that are a source of the dipeptide and properly adjusted supplementation with high doses of carnosine help to increase its concentration in tissues. Insufficient carnosine levels in the organism are the most probable in people who follow a vegetarian diet and seniors (with age, the concentration of carnosine in the organism decreases). As a result of physical effort of high intensity, there occurs increased production of lactic acid and the concentration of hydrogen ions increases, which leads to excessive acidification of the organism and can contribute to a decrease in exercise capacity and muscle strength. Carnosine performs the function of a mobile pH buffer for tissues which, as a result of obtaining energy though glycolysis, are particularly susceptible for disorders in the acid-base balance (that is mainly skeletal muscles). Carnosine has the ability to reduce the level of hydrogen ions in muscle cells, thanks to which it helps to keep the balance between acids and bases, which translates into increased exercise capacity and longer and more efficient workout. As a substrate crucial for carnosine production, beta-alanine has a significant effect on the protection of the organism against free radicals. That is because carnosine exhibits extraordinary antioxidant properties. The dipeptide buffers reactive oxygen species in tissues without completely inhibiting their regulatory and signalling properties. As the highest concentration of carnosine is found in excitable tissues, it plays a very important role in preventing oxidative stress. Oxidative stress also occurs during heavy physical effort and can have a negative effect on the performance and regeneration of muscle tissue. An increase in free radicals contributes to heavier fatigue of muscles and disorders in their homeostasis and has a negative effect on muscle contractility, so it is extremely important to take proper care of antioxidant protection. To sum up, BioTeck Beta Alanine is a dietary supplement that efficiently increases the efficacy of the anaerobic energy system, reduces the time needed for regeneration between sessions, and makes it possible to intensify training even more. Supplementation with beta-alanine can help to increase carnosine levels in muscles up to 64%. The preparation can be used by everyone, regardless of their preferred physical activity. The benefits of using the preparation will be visible both for endurance and for strength athletes. Mix 2 g (half a scoop = half a teaspoon) of powder with 400 ml of water or juice. Take two portions a day, 1 portion about 30 minutes before workout, the second – after workout. The recommended daily dosage should not be exceeded. Mix 2 g (half a scoop = half a teaspoon) of powder with 400 ml of water or juice. Take two portions a day, preferably with a meal of your choice. The recommended daily dosage should not be exceeded. 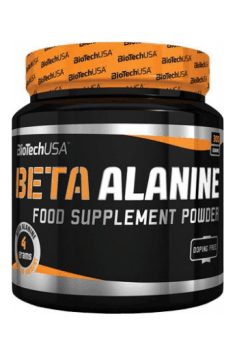 Many people believe that the efficiency of beta-alanine is connected with the sensation of paraesthesia. The interpretation is wrong, as the symptoms typical of beta-alanine, such as: tingling, itching, and stinging, are just a side effect, not an indicator of quality. The intensity of those symptoms is individual for every organism and its reaction to the amino acid. The symptoms can also mean that the dose is too high and it should be divided into smaller portions. Some time must pass before you feel the benefits of supplementing beta-alanine. According to scientific research, supplementation can last about 2 months, then you should take a break for about 30 days. The standard daily dosage of beta-alanine is 4 g a day. In times of a more intensive training period, beta-alanine can be taken along with, for example, BCAA, creatine, glutamine, and alpha-lipoic acid in order to reinforce its activity.